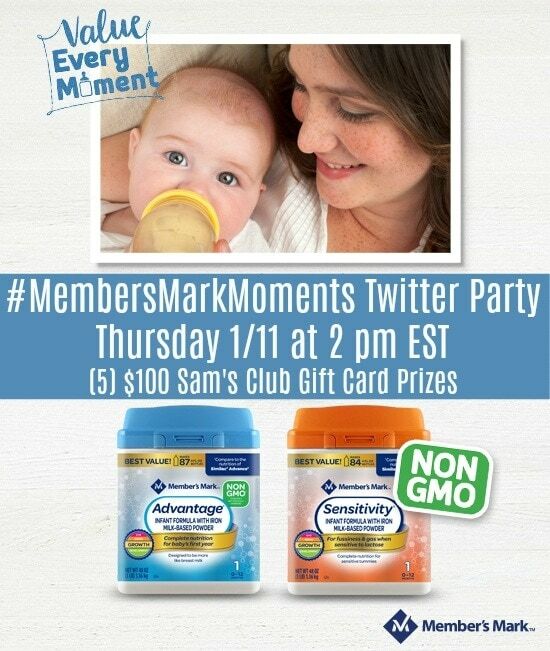 Join the #MembersMarkMoments Twitter Party on January 11th! RSVP Now! Post sponsored by Mirum Shopper. Opinions are 100% my own. I’m excited to be hosting the #MembersMarkMoments Twitter Party on January 11th and I hope you’ll join us! Having a newborn is exciting and full of amazing parenting moments! These moments are what being a mom and dad is all about. Being a parent is also expensive! Between everyday baby expenses and unexpected purchases, that little bundle of joy can cost a bundle, too, especially during their first year. During our Twitter party, we will be talking about ways parents can save money this year! One easy way to save on baby supplies is to stock up on Member’s Mark infant formula at Sam’s Club. Member’s Mark Formula from Sam’s Club offers the same high-quality ingredients as national brands, while allowing shoppers to save $450 annually. Even better, Member’s Mark is now non-GMO! Member’s Mark Formula: Sensitivity – Tender tummies love our Sensitive formula. It’s ideal for lactose-sensitive babies and features a unique blend of DHA, lutein and vitamin E.
Member’s Mark Formula: Infant – Get your baby started right with our Infant formula. It contains nutrients found in breast milk and an excellent source of nutrition for the first year. 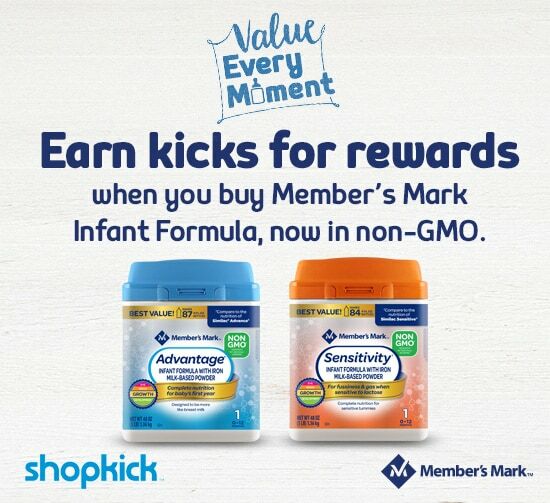 Member’s Mark Formula: Advantage – Our high-quality Advantage formula is made to resemble breast milk, and contains a unique blend of DHA, lutein and vitamin E.
Member’s Mark Formula: Gentle – A special milk-based formula with easy-to-digest proteins. Member’s Mark Gentle is formulated with a unique blend of nutrients that support your baby’s brain development. Check out the full line of products the next time you visit Sam’s Club! This Thursday I will be joined by Mariah at The Simple Parent for a fun Twitter party where we will be talking about motherhood, precious parenting moments, and how we can all save a little money in the new year! We will also be giving away 5, $100 gift cards to Sam’s Club! PRIZES: (5) $100 Sam’s Club Gift Cards. OFFICIAL RULES: Read Official Rules Here. Open to U.S. Residents Only. Leave your Twitter handle below to RSVP for your chance to win during the Twitter Party! Good luck and see you Thursday!